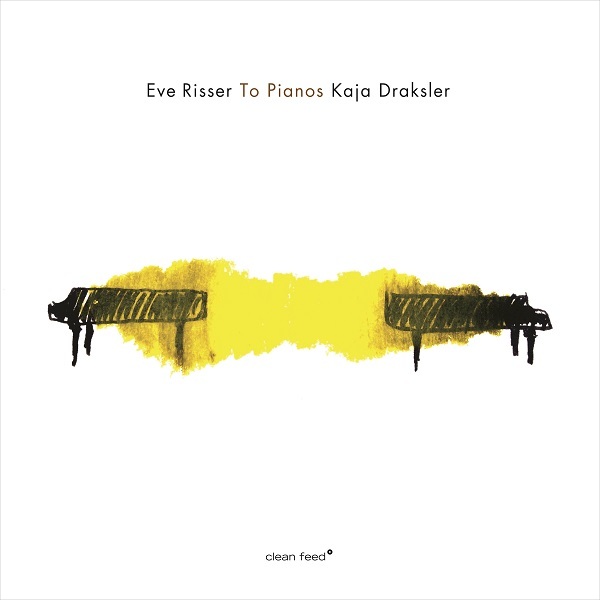 French pianist Eve Risser and Slovenian, Amsterdam-based pianist Kaja Draksler have proved again and again in recent years that they are distinct and compelling pianists, improvisers, and composers like no other. Both blur common distinctions between free improvisations, free jazz, and contemporary music, often experimenting with extended techniques and assorted preparations on the piano strings. Risser did it on her solo piano album, Das Pas Sur La Neige (Clean Feed, 2015), with the En Corps trio (the self-titled album and En corps-Generation, Dark Tree, 2012 and 2015) and with her White Desert Orchestra (Les Deux Versants Se Regardent, Clean Feed, 2016). 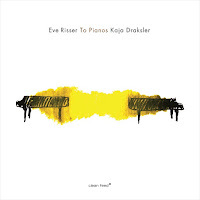 Draksler did so on her solo piano album, The Lives of Many Others (Clean Feed, 2013), her duo with Portuguese trumpeter Susana Silva Santos (This Love, 2015), and with her Octet (Gledalec, Clean Feed, 2017). Pedro Costa, the manager of the Clean Feed label and the artistic co-director of the Ljubljana Jazz Festival, invited Risser and Draksler to perform at the festival. To Pianos was recorded live on Risser's and Draksler's ‘world premiere’ performance on the festival's main, glamorous stage in July 2016 and exactly a year after, in the Gallus Hall of Cankarjev Dom in Ljubljana. Since then Risser and Draksler have continued to perform in this format. It is quite easy to be drawn by the beautiful, enchanting sounds of Risser's and Draksler's pianos. But To Pianos stresses that it is much more than the mere exploration of sounds and investigation of such sounds. It is more how these sounds are shaped, channeled and balanced between the two pianists in so many unexpected and disarming manners, creating an insightful yet coherent program. To Pianos begins with a ceremonial tone, as Risser and Draksler let their pianos ring, resonate and echo each other as an abstract church bells on the repetitive, Steve Reich-ian “Dusk, Mystery, Memory, Community”, composed by Draksler. The following, improvised title-piece sketches an almost silent, deep meditative soundscape, comprised of minute and gentle touches and brushing of the piano strings, with no attempt to let this experimental soundscape to sound familiar or even accessible. Risser’s “Eclats” is the first piece where both Risser and Draksler search for a melodic motif, but in a kind of mischievous, chaotic play. Both do not surrender to the harmonic options of this motif and often rebel against its conventional choices and instead opt to charge this delicate piece with dense overtones. This playful vein continues with the improvised “Sestri (To a Sister: Two Sisters)”, here in an imaginative, game-like manner. Risser’s “Kallaste, La Ville Abandonnée (The Ghost Town)” develops patiently as both Risser and Draksler wrestle their way to sketch kind of a dramatic, enigmatic hymn. The improvised “To Women” already sound like an advanced version of a much larger, orchestral composition, possessing the “Ellington-ian conception of symphonic piano playing”, as Hawkins notes. The cover of Carla Bley's “Walking Batterie Woman” does sound like a multiplying of Bley’s one-of-a-kind piano playing, with the eccentric humor, mischievous wisdom and arresting elegance. The last, short and improvised, piece, “To You” is an emotional homage of both these exceptional, innovative musicians to each other. Naturally. there are not many opportunities, or venues where you may experience, live such a unique duo. But consider yourselves very fortunate if you may happen to watch the fantastic Risser and Draksler on stage. Top album of the year!